Doing your good deed each day can be hard yakka, we get it. Between work, study, and maintaining some form of a social life, trying to squeeze humanitarian efforts into your schedule can take a pride of place on the backburner (not everyone can be Angelina Jolie okay?) But, if you’re anything like us, nothing quite beats the good vibes you get from doing something to help the environment for someone in need—not even a well-stocked cheese board or a glass of pinot. That’s why we’re pretty stoked to team up with our mates at 7-Eleven to bring you this list of low-key genius ways to help you change the world (with zero effort, mind you). No excuses! These legends have just launched their in-store coffee recycling system, keep reading to find out how you can recycle coffee cups. So go forth, enjoy the positive vibes, and do some good for the world all without breaking a sweat. Not bad for a millennial, hey. We’re pretty fortunate to live in a country with bins on nearly every street corner, but NGL it hurts our little hearts how often we spy rubbish lingering in gutters, on benches or on the ground. Take one for the team and the next time you see litter, pick it up and pop it in the next bin you see, it's easy AF! Just be sure to keep hand sanitiser on hand in case things get messy. Trust us, mother nature will love you for doing this (and may even bless you with some 10/10 weather as thanks). You know what gets us down? Realising there are a tonne of adorable puppers sitting in pounds longing for their furever home. Organisations like the RSPCA would grind to a halt without the help of volunteers, so check out their website to see what positions are available to apply for. And yes, there is even the option to walk and play with the animals! Or, if your love for the pups is real, see if there's a pooch that will fit your lifestyle to take home forever and save a life. This has got to be the cutest way going to help change the world! Gardening is the it-thing ATM, so if you’ve been thinking about it, there’s no time like the present! By setting up a small garden in your yard filled to the brim with fresh herbs and veggies you’re creating your very own ecosystem and saving money on your weekly shopping run. Don’t stress, we’ve already got the how-to guide for a herb garden here. Or if you’re confined to a small apartment, why not try some of these trendy indoor plants to spruce up your space. Plus—if you're planting natives or flowering varieties of herbs and veggies you'll be helping to save the bees! This one’s easy—recycle your morning (or hourly) coffee cups at your local participating 7-Eleven. ICYMI, guys, 7-Eleven is doing their bit to save the environment by properly recycling takeaway coffee cups, AND they make it easy for all of us to do with easy-access bins in their stores. Over one billion takeaway cups end up in landfill, so with a 7-Eleven on practically every street corner, there should be no more excuses for dumping your cup in a regular bin. And yes—they take ANY coffee cups, so you can pile up the cups from your office, house, car—whatever, wherever—and dispose of them at a 7-Eleven to help out mother nature. This one is so simple but it's easy to forget. Doing something kind for someone who needs help (or just a mood boost) will not only make you feel good but also make someone’s day. 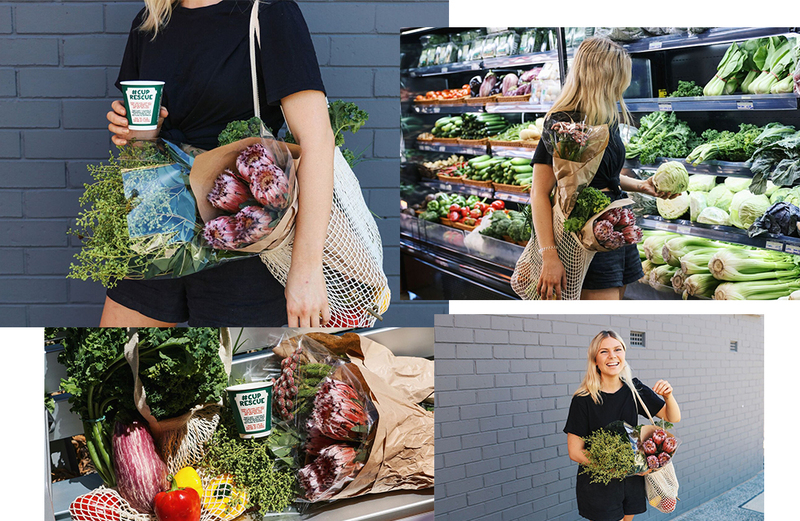 Whether it’s helping the struggling old lady carry groceries to her car, helping a workmate out with a project in your downtime or even paying for someone else’s morning coffee (in a reusable cup of course! ), this act will definitely deliver the good-vibes all-round. We don't know why we don't do it more often. We can’t all have the wardrobe of Carrie Bradshaw, so if your cupboards are overflowing with once-worn or too-small items, donate your clothes to make space for some newbies from the op shop. This is a double-whammy win, you can clear your own headspace by de-cluttering your wardrobe and you can help someone in need of some new clothes. Or, if you're lusting after something new, check out these ethical Aussie fashion brands. Donating to charity is one of the easiest ways to help change the world, but with an enormous amount of charities around it can be hard to decide who to help out or how much to donate. DW though, we got you. We’ve found an easy fix for anyone who walks, runs or cycles to work: Charity Miles. It’s an easy to use app that’s budget-friendly and perfect for a busy lifestyle. The best part? It’s free! Yup—you do the running, big corporations do the donating. You can choose which charity your donation goes to and, bonus, it's easy to use on Android and Apple devices. Honestly! Look, we know it’s easy to chuck your sandwich in plastic wrap or to buy a bottle of water, but you can help the environment out simply by reducing the waste you create by using reusable plastic and glass-wear. Trust us, there’s something oh-so adult about sipping your morning latte from a reusable cup or using reusable bags at the grocery store. Make sure your car is loaded with a non-plastic shopping bags, non-plastic produce bags and a water bottle so your adult self is prepared for all that life throws at you. Feeling #inspired? Us too. That’s why we've teamed up with 7-Eleven to bring you these genius and low-effort ways to change the world—so you can feel the good-vibes and maintain your day-to-day lifestyle at the same time. If you’re curious about 7-Eleven’s recycling initiative you can find out more information here. Editor's note: This article is proudly sponsored by 7-Eleven and endorsed by The Urban List. Thank you for supporting the sponsors who make The Urban List possible. Click here for more information on our editorial policy.